The entire subcompact CUV segment owes its existence to the Buick Encore and it’s still one of the most popular cars in the little world it created. What do you need to know before you buy a Buick Encore? Don’t worry, we’ll tell you everything right here in our Buyer’s Guide. Someone at Buick is a genius for seeing the possibilities in the small crossover market. While a few brands make small premium crossovers overseas none of them had deigned bring them over here until one (or multiple) bright minds had the idea of rebranding a European hatchback as a Buick. The concept is fairly simple and one that you’d have thought Acura would have come up with before Buick. It’s small but nice and it looks rugged and offers some premium options like blind spot monitoring and WiFi as well as available AWD. 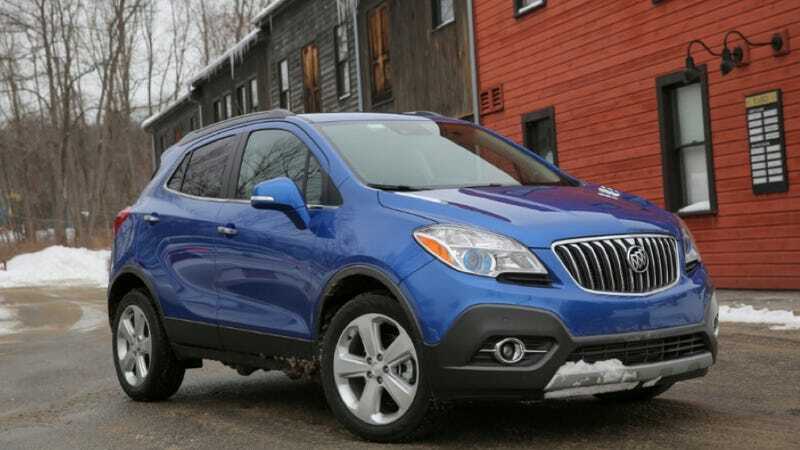 It’s now having to compete with vehicles that offer more performance or options, but the Buick Encore is still one of the most interesting and well-packaged cars in the market. Think of it as an XV Crosstrek for people who watch Fox News instead of MSNBC. The Buick Encore launched along with its overseas sibling, the Opel Mokka, for the 2013 model year. 2014 brought a few safety gizmos like Rear Cross Traffic Alert and blind spot monitoring, while 2015 brought a new OnStar system with 4G LTE and Wi-Fi hotspot capability. Otherwise, the short little Buick is pretty much unchanged from the model that launched three years ago. Like its twin the Chevy Trax, there’s only one engine and one transmission. Unlike the Chevy Trax, the options available are pretty good so we’d add the convenience group package which gives you dual zone air-conditioning, Rear Cross Traffic Alert, a better sound system, and fog lamps. The total cost is $27,080 with a $925 destination fee if you go with the front-wheel-drive model which you probably should if you’re not driving on snowy roads.